Each Dolan Tool is handmade from the finest high carbon knife steel. They are meticulously formed and sharpened using methods only used by Dolan Tools. The fine edge of these tools are tempered and treated to withstand the vigor of the true ceramic artist. Together with the superior tool head with a fine lathe turned hardwood handle and the Dolan Tool becomes the instrument of your expression. Dolan Tools believe that you deserve a tool that has been given the same personal care as the pieces that are created with them. A flexible knife that is made from the highest quality steel and shaped to fit comfortably in your hand. Very sharp and will last a long time with proper maintenance. Go to Dolan Tools website for more information about how to care for your quality tools. PG699Georgies Cascade Stoneware Gloss Cone 6 Glazes Sample Sethttp://www.georgies.com/products/glazes/thumb-pg600-shot.jpgGeorgies Ceramic & ClayPG600s Cascade Stoneware Gloss GlazesPG6994oz jars of 30 different glazes in Georgies Cascade Stoneware Gloss glaze line. (F) Flat, or A) Angled. One of Dolan Tools longest standing and most revered line of tools. With a cutting edge length of about 1¼" and its signature tapered tang that allows for flexible work angles, the 100 Series is ideal for wheelwork, slab, and hand building projects. Dolan Tools most revered line of tools combine the durability and appeal of the 100 series in a smaller version. With a cutting edge length of about 1" and its signature tapered tang that allows for flexible work angles, the 100 "S" Series is especially handy for detailed and delicate pieces. These heavy duty tools are made from high carbon knife steel, permanently bonded with industrial adhesive in hardwood handles that have been oil/resin soaked to seal them against moisture. Ideal for trimming, slicing, and shaping your greenware projects. 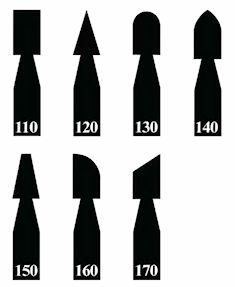 This medium range line of professional cutting tools are similar to the larger 300 Series tools. 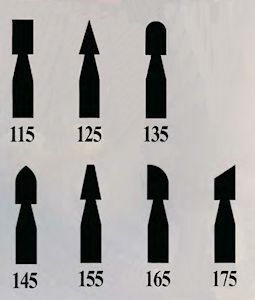 The 400 Series offers a different variety of tool head shapes. The smaller handle makes them ideal for precise trimming and shaping. These tools combine a variety of popular shapes, versatile sizes, and various gauges of steel to fit the need of any ceramic artist. The DT510/DT570 head size is the same as the 300 series head on a 400 series handle. The DT511/DT571/DT525/DT555 head size are the same as the 400 series. The DT512/DT572 head size are the same as the "S" series. These small, tough tools are designed for modeling and wheel work. They are especially effective on delicate, finely detailed pieces. 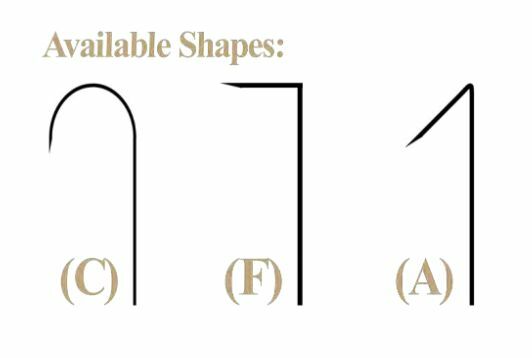 The "M" series tools are miniature versions of the "S" series sculpting tools and perfect for intricate detailing. These are made of the same high quality US knife steel used in all of the Dolan tool lines.